The best from Rinnai, RUR98 tankless water heater is a powerful and efficient unit that heats water on demand and delivers it in endless supply to large homes. High water flow rate and accurate temperature control. Advanced technology ensures savings up to 40%. Lots of hot water. 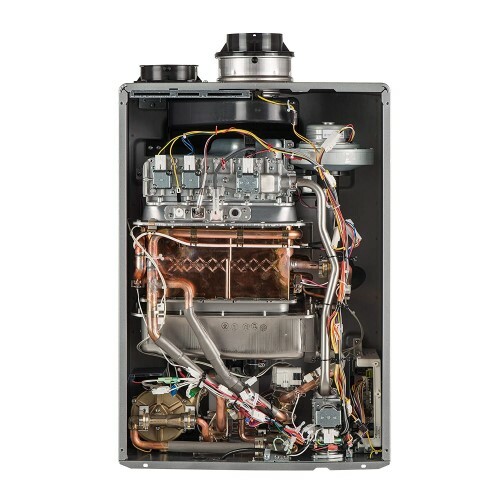 One of the users was excited that his new Rinnai RUR 98 was able to provide plenty of hot water to the dishwasher, washing machine, and 3 showers - simultaneously. Saving space. Approximately 70% of space was saved when one user switched from 50-gal tank-type water heater to Rinnai tankless water heater. Fast hot water delivery. This user lives in a colder climate, and his problem was the lower incoming water temperature. By using the RUR series and its recirculation feature, he was able to get hot water fast and at the set time - even faster than the traditional tank-type heater. The other user noticed a 50% decrease in water consumption. The main complaint is the initial price of the unit and installation cost. While using the recirculation, the owners complained about the water noise inside the pipes, pump humming, even water hammer. Also, there were some issues with the circulation pump. Note: Many users agreed that the professional should install the unit, and not the amateurs!